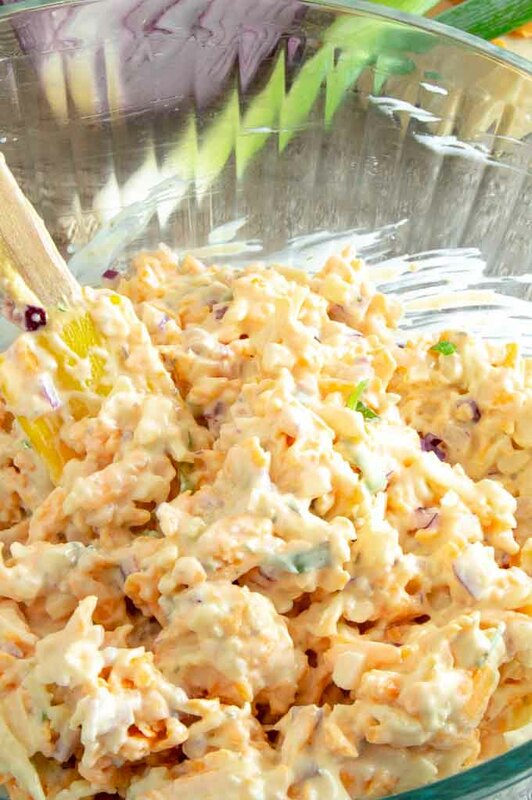 This 5 minute Crack Dip comes together in 5 minutes and is perfect for serving with crackers. 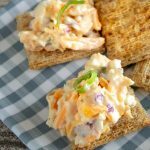 Ideal for pool side snacking, game day snacking or just to serve with cocktails! With summer in full force I find that company comes to our door at the last minute often. Never one to shy away from putting out something to nibble on with a cocktail I have a stash of quick recipes made from things in the pantry that I can whip up ASAP like this Cream Cheese dip or this Classic Pickle dip recipe . Today’s recipe for 5 minute crack dip is one of those recipes. My friend Ellen had us over for dinner recently and she served this dip as an appetizer with cocktails. After pretty much demolishing her whole spread I asked her if I could share this on my website and she was totally cool with it! I adapted it ever so slightly with the addition of some pimentos and upping a little bit of the secret ingredient! What is Crack Dip? It’s an urban word for something that is very addicting. Trust me on this one, you and your guests will have a hard time not continually going back for more of this easy 5 minute dip! Party Dips are easy to make and keeping a well stocked pantry for them is easy to do. Keeping things on hand such as cheeses, crackers, salamis, nuts will go a long way to helping you always be prepared. All of these ingredients can really aid you when people are coming over. You can put together a French Onion Tart, a baked brie with almonds and a honey drizzle, a charcuterie platter, chips and dips, crackers with various cheeses or even Cheese filled pastry straws. The trick is being prepared so print out the list and stock your pantry for all of your company! How do you make 5 minute Crack Dip? 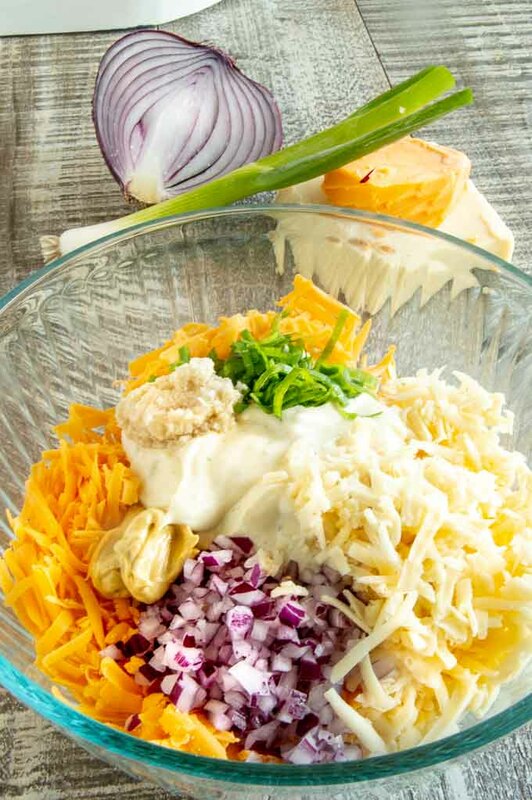 Shred the cheeses, chop the onions then place everything into a bowl. Can that be any easier? Seriously, thats all there is to it. Can you freeze this dip? No- it comes together so quickly you don’t need to. It will last about 5 days in the fridge in a sealed container. After that the consistency of the dip changes and isn’t as delicious. You can make it a couple of days ahead for your party if you need to! PRO TIP: Homemade mayo is very easy to make and tastes a million times better than store bought. I have a Fresh and Easy Mayonnaise recipe here you can whip up in 5 minutes and there will be enough left for other things too. Give it a try sometime I promise you’ll never buy store bought again. 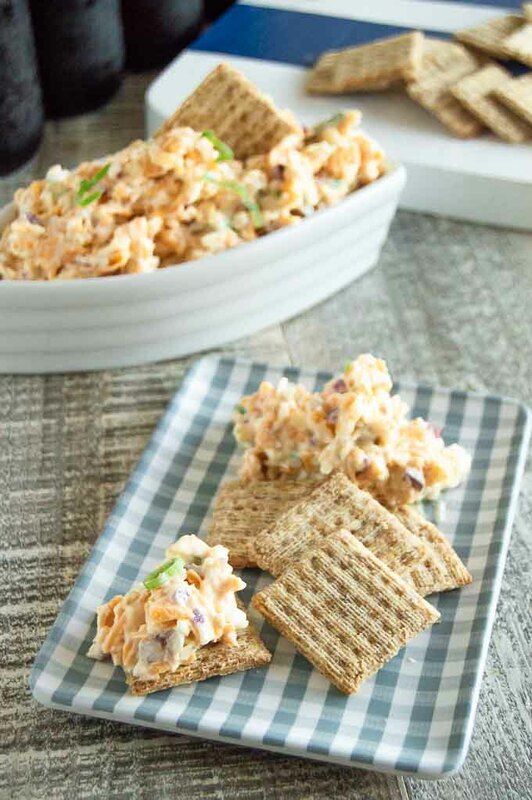 Pin this to your Easy Appetizer Board on Pinterest! Lets Be Friends …. follow me on Pinterest for more ideas for stress free entertaining with confidence! Stir all ingredients together. It's best if chilled in the fridge and the flavors are allowed to meld for at least an hour. Can be made up to 2 days ahead and stored in an airtight container in the fridge. Serve with your favorite cracker. The dip is hearty and I serve it with triskets so they hold up without breaking. Oh my gosh how terrific you are!! I will keep your Lists and use them! 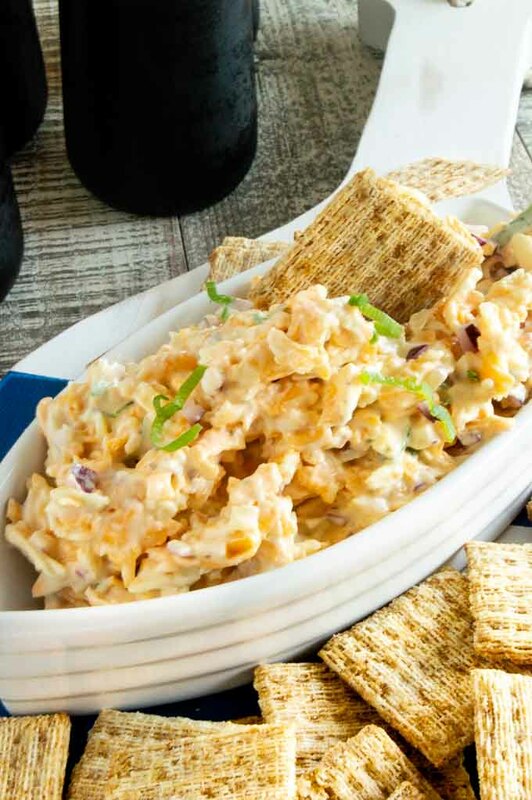 The Crack Dip sounds delish! Will definitely be making it soon. I’m happy to now “Follow” you on Pinterest because I expect to find many good hints and recipes from you. Happy New Year! I will trust you and make this soon. The name itself is begging me to taste your dip asap! I can see why you call this crack dip! So good! Holy crap, you must really mean it when you say “urban”. Here in the country we have unexpected visitors maybe once a year. But – hey, more for US, right? This looks fantastic. I will be eating it, and probably arm wrestling The Man for my share. Yum! It’s easy to see why this dip is addictive! I would dare say, dangerously so!!! Bookmarking this tasty creation for our next get-together! This post has such a wealth of information!! I love having item’s on hand for those quick get-togethers – and you have it all spelled out in one spot! Thank you! And that dip? Yep!! Pure crack! I see how this dip would be a life saver! It is really so easy to put together. Thank you for the list of things to keep in hand for easy entertaining. As usual your posts are so helpful and full of great information!